Are your workdays busy but lacking that satisfying sense of productivity? Has tracking your time become a hassle? Meet Daycast, the desktop app that makes time tracking effortless and overall time management easier. Let Daycast help you make the most of your greatest asset: your time. Are distractions killing your focus? Do your workdays feel busy but fruitless? Did your last time management effort give you headaches? Is time tracking an interruptive chore? Are your best ideas gathering dust? Does updating your team mean breaking your concentration? Build a day plan that advances your goals and minimizes reliance on interruptive habits. Seamlessly track your time by logging in and out of tasks in your day plan as you work through the day. 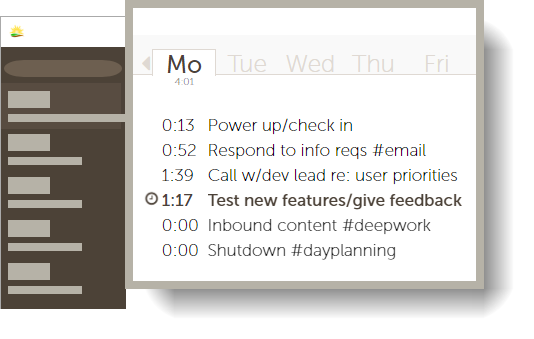 Effortlessly inform your team—your status updates automatically to reflect your current task. "We have a lot of competing priorities and a very small team. It is critical for us to know where our time is being spent. With Daycast, I can set up all of my tasks and clock in and out of them as I switch between them. It has streamlined the reporting process immensely. It has also improved the accuracy of my time reporting." You don't have to adopt any particular philosophy to use Daycast effectively. It’s flexible enough to work well with your favorite methodology and to gently guide you to productivity even if your methods are evolving. It makes time tracking frictionless. With Daycast, your day planner is your time tracker. Which means you don't have to fracture your focus just to keep track of your hours. If you use it with a team, it's silo-busting. Ever spent a morning on something for a teammate only to discover that they’d rerouted? With Daycast, teams know what everyone’s working on at any given moment. Don't let rigorous systems and complex software lead you further down the busy-with-nothing-to-show-for-it hole. Try Daycast free for 30 days. Harness your focus and shepherd your projects to their fullest potential. Is Daycast right for you? Learn more about who it’s for.